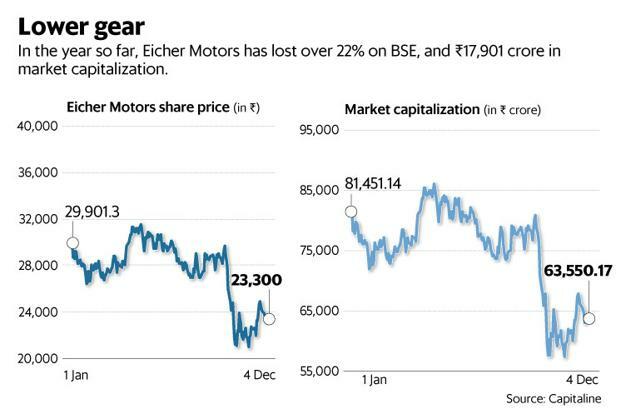 Mumbai: Once the most preferred stock in the automobile sector, owing to its storied motorcycle brand Royal Enfield, Eicher Motors Ltd has lost about ₹17,900 crore in market capitalisation so far in 2018, according to data provided by Bloomberg. To explain the fall, analysts cite factors such as slowing sales growth off a high base for Royal Enfield, increasing brand fatigue for the classic British brand’s limited portfolio, reduced waiting periods owing to higher production capacity and increasing competition in the premium motorcycle category. Higher insurance costs and unfavourable macroeconomic factors, such as tightening liquidity conditions, higher inflation and a falling rupee also impacted consumer sentiment and hit demand for Royal Enfield and the broader industry. However, Royal Enfield’s volumes in the mature states of New Delhi, Maharashtra and Karnataka have been under pressure for more than a year, said Ashutosh Tiwari, head of Equirus Securities in a 13 November note, adding that booking levels softened in Uttar Pradesh (India’s largest two-wheeler market) in August and September, but picked up during the festive season. Due to a negligible waiting period for most models except recent launches, advance bookings have reduced, Tiwari said, adding “the aura around the bike created by longer waiting periods is also fading, and this has a perception impact”. Shorter waiting periods, coupled with a stagnation in demand, imply Royal Enfield will no longer be immune to the overall demand scenario in the domestic motorcycle industry, said analysts at Prabhudas Lilladher Pvt. Ltd in a 12 November note. To factor in the “demand challenges, no strong order book and expected to increase in competition”, the Mumbai-based brokerage firm has also reduced its volume and Ebitda margin estimates for this fiscal and the next. Ebitda stands for earnings before interest, tax, depreciation and amortization, and is a key measure of operating profitability. Additionally, competition in the premium category is set to heat up in the coming months as at least half a dozen motorcycle makers, including the iconic Harley-Davidson Inc., prepare to launch models in the middleweight category (250cc-750cc) in India, diluting Royal Enfield’s dominance. In the domestic market, Royal Enfield’s most popular model, the Classic 350, now has a direct competitor with the reintroduction of Jawa motorcycles in India in November by Classic Legends Pvt. Ltd, a Mahindra and Mahindra Ltd (M&M) subsidiary. The maker of the Bullet and the Classic models are banking on new launches and under-penetrated markets in India for its next wave of growth, as the broader trend of up-trading to pricier and more powerful motorcycles continues. “We believe we have strong potential to grow and expand markets wherein the size of mid-size motorcycling segment is very less in comparisons, such as Uttar Pradesh, Madhya Pradesh, Bihar and Rajasthan”, said Eicher Motors in an emailed reply to Mint queries. The Gurugram-based firm unveiled the Interceptor 650 and Continental 650 models (650 twins) last week as an entry point into the more mature global market, in addition to a more powerful option for Indian customers to upgrade to. The firm believes the twins are a “vital” part of its portfolio but expects single-cylinder motorcycles “to be dominant in India for the immediately foreseeable future”. 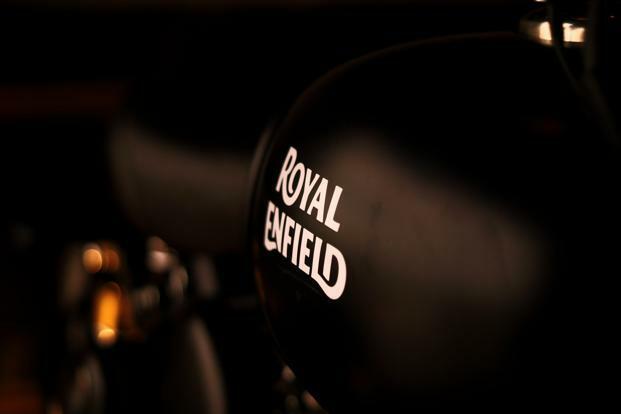 Analysts believe Royal Enfield’s increasing emphasis on expanding its presence in global markets will not bear much fruit in the near-to-medium term. Describing the strategy as “long-drawn”, analysts at Prabhudas Lilladher said it “would be a drag on the margins” with “no major volumes expected in the near to medium term”. Unfortunately, “now is the time when Royal Enfield needs to make the export market work” as the “honeymoon period” ends in India, said Deepesh Rathore, co-founder and director at London-based Emerging Markets Automotive Advisors. “Sales in the US need to increase ten-fold from 1,000 units now in three years’ time. RE needs to make a mark in high-margin markets”, Rathore said, adding that overseas success would also enable the firm to explore more products on the newly-developed platform and “open up the next leg of growth”. The twins fit “very well” in the traditional American market of big bikes, which is now looking for easier, smaller bikes to ride, Rathore said, adding that profitability in India will come under pressure because the new launches, which have lower margins, are likely to cannibalise sales of the Classic 350 and Classic 500, which are more profitable.